After reviewing the options and hands-on testing, the Panasonic Arc5 ES-LV65-S wins our top pick for the Best Shaver on the market with its superior shave and a history of glowing reviews. For clearing away facial hair, men have two choices: a modern electric shaver or the age-old razor and blade. I have favored electric shavers over razors for nearly 30 years, and through the decades I've used and tested various models from three leading brands—Braun, Philips Norelco, and Panasonic. Today, my shaver of choice is Braun's top-of-the-line Series 7 model 790cc–4, which I started using after its debut in 2010. The Series 7 also ranks at the top of Consumer Reports' shaver test. And to-date, Braun still has not announced any intention to replace it with a new top model. Nevertheless, I wanted to know: What is the best men's electric shaver now, at any price? Is there a newer shaver from any brand that's better than the Braun Series 7? To find the answer, I searched the Web for reviews of an assortment of shavers from various brands, compared technical specifications and prices, then tested out the top contender head-to-head against my beloved Series 7. I discovered the Series 7 has been equaled in user reviews online, by the Panasonic Arc5 model ES-LV61-A—an electric shaver with five blades, two more than the Series 7. To see if I would agree, I contacted Panasonic to request a review unit. I learned that there is an even newer Arc5 model that is just debuting in stores— the ES-LV65-S—that shares all the best features of the LV61, plus adds a new "stubble sensor" that automatically detects your beard's density and adjusts the shaver's motor speed to optimize cutting ability. With review unit in hand, I went about testing the ES-LV65-S against my tried-and-true Series 7. While it was a close call, the Panasonic ES-LV65-S gets my pick for the best electric men's shaver based on its superior shaving results, even if it comes at a stiffer price. Whereas the Series 7 utilizes three cutting blades (two at the front and back edges and one in the center), the Arc5 has five: two at the front and back edges, two adjacent to these, and one in the center. Whereas the Series 7 has a powerful motor that keeps the shaver’s cutting head moving at a super quick speed of 10,000 vibrations per minute — to help lift hairs off the skin and prepare them to be cut — the motor in the Arc5 is 40 percent faster, vibrating the cutting head at a rate of 14,000 cycles per minute. The new “stubble sensor” in the LV65 automatically detects the beard’s density and adjusts the shaver’s motor speed to optimize the device’s cutting ability. Both the Series 7 and the Arc5 feature 100 percent waterproof bodies, so they can be rinsed clean under running tap water. But the Arc5 is marketed as a “wet/dry” shaver that can be used with shaving foam or gel if desired, and the Series 7 is not. An on-paper comparison is one thing, an on-face comparison quite another. Indeed, like a facial vacuum cleaner, the Arc5’s five-bladed shaving head erased my beard stubble quickly and efficiently, sometimes needing only one stroke to clear an area of my face, even with two-days of growth. And, overall, it completed the shaving task in as few or fewer strokes than my Series 7. But as with other Panasonic shavers, I found that the Arc5’s extremely large shaving head made it awkward to use, especially around the edges of my sideburns. Aesthetics are always a matter of personal opinion, of course, but I also thought the Arc5’s shaving head was disproportionately oversized and visually weird atop the shaver’s slim body. The Braun Series 7 design is proportional and stylish and more appealing to me. There is no denying the popular consensus around the ES-LV65’s predecessor, Panasonic’s Arc5 model ES-LV61-A. Amazon ranks products according to their share of positive user reviews, updating the rankings daily. And as I'm writing this article, in the category of “mens foil shavers” the Arc5 is up near the top, ranked in fourth place behind two other Panasonic shavers and the Series 7—having only recently dropped below the Series 7 in rank. I like that my Braun 790cc came with an accessory machine that uses an alcohol–based cleaning and lubricating solution in “Clean & Renew” cartridges (sold separately) to refresh the shaver after each use. In packs of four at Amazon.com, those cartridges cost about $5 each. Shaving every other day, I normally consume one cartridge per month (12 per year). Many people would consider using such a cleaning system for a shaver that can be rinsed off in the sink to be silly. It adds to the cost of the shaver, creates monthly cleaning cartridge expenses and takes up more space on your vanity. And for those people, the fact that the Panasonic LV65 is sold without the cleaning machine option could be a benefit. But if you really want it, the ES-LV95-S comes with one for an extra $100. If you're looking for the best shaver on the market, go for the new Panasonic Arc5 ES-LV65-S. It takes the winning technology of its predecessor and steps it up a notch. If you don't want to plunk down the admittedly pricey $399, the Braun Series 7 model 790cc and Panasonic ES-LV61-A are fine runner-ups that will save you $100-$200. And if you're really on a budget, check out our pick for the Best Shaver Under $100. All of the above shavers fall into the “foil” category. That means their blades sit beneath a curved metal cover with a pattern of holes to capture hairs for cutting (the foil). The other major shaver category is “rotary,” dominated by Philips Norelco models. Rotary shavers have blades that sit beneath round hole–covered heads that spin to capture and cut hairs. Bestratedelectricshavers.com offers an excellent exploration of the differences between foil and rotary shavers. I also researched the best rotary shaver available today, and easily concluded it’s the Philips Norelco SensoTouch 3D, which features three shaving heads fixed in three independent sections, each able to move in three dimensions — pivoting around, tilting inward and flexing outward — to shave closer on face and neck curves. And each of the three heads also incorporates three different schemes for capturing hair to be cut: channels to catch longer hairs, slots to catch normal length hairs, and holes to catch short stubble. A few SensoTouch 3D models are available, but the top–rated of all is the 1280X, which is the top–rated rotary shaver at Amazon.com, (where it sells for $312.95, discounted from an MSRP of $349.99). It also is the top–ranked of all electric shavers in ShaverGuide.com’s Top 10 list, and it garnered a “top rated” listing and accompanying stellar review at Bestratedelectricshavers.com. However, the 1280X is one of those shavers that includes a cleaning machine. For those who prefer to buy just the shaver, the technically identical SensoTouch 3D 1290X (MSRP and Amazon.com price of $249.99) excludes the cleaning machine and offers a significant discount. I tested a review unit of the 1290X with three–day stubble and found it quickly eradicated most of the whiskers on my face and neck. I was unable to accurately shave around the edges of my sideburn with the rotary heads, however, when following the recommended procedure with rotary shavers of using circular sweeping motions. I substituted the shaver’s horizontal long–hair trimmer as a solution, but it did not perform the task anywhere near as well as a foil shaver does. The motor in the 1290X also seemed to me less powerful than that in either the Panasonic Arc5 or the Braun Series 7. None of this was a surprise to me; I have found in past trials that the best foil shavers provide me a closer shave than the best rotary shavers. But here, of course, is the overarching caveat: Your preference may vary. If the store’s return policy allows it, sample each of these for two to three weeks — the time it usually takes for skin to adjust to an electric shaver when switching from a manual razor — keep what you like and return the others. I realize you’re a little late to the promotion for Christmas buying but to leave out Remington from the mix seems to suggest a serious bias. Had you at least had their shavers under consideration I would have give your review a little more respect. Just thought you should know in the event others didn’t care to share. No kidding or bias, just reporting. Remington appears at the bottom of Consumer Reports magazine’s recommended shavers list (in which models by Braun, Panasonic and Philips Norelco predominate), nor high on the top–rated men’s shaver list at Amazon.com (which also favors those other three brands). It is true that my own shaver experiences through the years have been with models from those three brands (which I disclose in the article), but I started my research by checking online sources to find the brands and models most favored by other people, and then proceeded to reach my conclusions — which included my choice to award this publication’s “Best” title to a Panasonic model despite my personal preference for a Braun model. As I stated toward the bottom of the article, the overarching caveat is that “your” (the reader’s) preference may vary from the conclusions and preferences offered here. I am inferring from your comment that your personal preference is for a Remington model, and I’m glad that you have found an electric shaver that satisfies you. Who would want a Remington? I would never buy another product from Remington once I gave it a try and purchased their manual razors. They simply could not compare with Gilette ones. And the blades went dull very quickly. I suspect even their cutter blades or outer foils on electric shavers will not perform nor last reasonably long enough. “I have found in past trials that the best foil shavers provide me a closer shave than the best foil shavers.” Say What? Thanks for catching that. Obviously, should be “the best foil shavers provide a closer shave than the best rotary shavers.” Fixed. 14,000 is 40% greater than 10,000, not almost 150% greater. My goals for 2014 are just about wrapped up now. The best electric razor is the Gilette Fusion Power. The Fusion might be a fine razor but it is not considered an electric. I own the Braun 790cc and the Philips RQ1285 and 2.5 year old Panasonic 4 blade (not sure of the model) I have to say that the Panasonic is by fat the closest and quickest shave out of the three. I purchased the Braun 8 months ago after the blades in my panasonic went a little dull as it was on special and the sales person at shaver shop was very convincing. While I enjoyed the smaller and smart looking Braun, I was uncertain if I was experiencing a close shave like the panasonic when it was new. I decided to buy new blades for the panasonic and test for 7 days using the Braun and Panasonic on left/right side of my face. The panasonic wins hands down as less passes to clear the stubble and did end up being the closer shave even after multiple passes with the Braun. My son broke his Philips shaver so I gave him the Braun as I was getting a better shave from the Panasonic. My panasonic went missing during a holiday to Bali and I suspect that the room service guy liked the look of it. I had been using an electric for three years and had to buy another as soon as possible. Harvey Norman only had the Philips and reviews seemed pretty good. Well I’m 14 days into using the philips and have to say that I’m not enjoying the lomger time as almost 3 minutes longer that the foil shavers to clear the stubble. While the overall result is pretty good, the philips to date does not do so good under the chin. I will keep trying for another 7 days and if things don’t improve then I will be taking philips up on the refund guarantee. At this stage I can see myself buying the latest 5 blade panasonic as that brand seemed to be the best of the three mentioned here due to being quickest close shave, longest battery life and easiest to clean. It ultimately comes down to which of the 2 technologies you prefer, which one of them suits your skin best. In my opinion Philips 1280x is probably the best electric shaver around, as probably will be for a while if Panasonic doesn’t come up with something fine tuned. I’ve just purchased a Panasonic ES-LV65-s and it is by far the best electric razor I’ve ever owned. We were obviously very impressed with it in our testing, and it’s great to hear you’ve had the same experience. Panasonic the best - by far!!!! I have tried all variations, from Remington, Philips, Braun and now Panasonic. I thought that Braun was the best option, however, now I can honestly say that the Panasonic ES-LV65 is the very best by a long shot! My skin feels so smooth after using it, unlike the Braun that I was using before, which gave me a 5:00pm shadow after midday. Well done Panasonic, you have produced a terrific shaver!!! what is the diffrences between lv61 or 65 or 81 or 95 ? which model is better and shave live gillette ? The main difference between the LV65 and the LV61 is that the LV65 has a “stubble sensor” that automatically detects your beard’s density and adjusts the shaver’s motor speed to optimize cutting ability. While this provides a slightly better shave with the LV65, the LV61 is also an excellent choice if you want to save some money. The LV81 and LV95 are identical to the LV61 and LV65, respectively, as far as the shavers. The only difference is the automatic cleaning kit and charger they come with (not worth the extra cost, IMHO). in the last , you suggest me buy lv61 or lv65 to get the close and comfortable shave ? For years i saw my husband keep on changing razors but, like a year he didn’t make any move. Actually i didn’t bother to look why is it so. After reading your post now it’s clear. Guess what, he is using Arc5 ES-LV65-S. I stumbled upon this review after I had purchased the shaver online and I am glad I did. It came yesterday in the mail and I love it. Its year end 2014. Stumbled upon a reasonably priced Panasonic Arc4 4-Blade ES-LA93-K (US$ 170 & 40% discount on Cleaning & Charging Station till 12-31-2014) with good reviews AND Braun Series 7 799cc-7 - is brand new - need your opinion on which betters the Panasonic Arc5 ES-LV65-S. Perhaps there is a new Arc5 that shadows LV65-S. Comments, advice solicited. Sorry for getting back to you a little late here. All you mentioned are excellent shavers. The Panasonic Arc 5 models outperform the Arc 4s, though you would be happy with either line. If you want to save some money versus the LV65, the ES-LV61-A in the Arc 5 line we mention above is very close in performance, but will run about $100 less. I believe the 799cc has the same head as the 790cc above, so I would expect very similar performance. So if you want to “best”, our recommendation still stands. However, you won’t be disappointed if you save money with the other models you mentioned. I absolutely LOVE the Rotary Electric Shaver.A electric shavers is an excellent means of shaving. After trying many types of shavers and products in college, my preference if for Philips rotary shavers. I have a good one that has lasted me for over two years. Right now on Amazon, the LV65 is $390 and the LV61 is on sale at $150. If the stubble sensor is the only real difference between the two, and the LV65 only provides a very slightly better shave I don’t see any reason to spend $240 more for something I may hardly notice. Would you agree? If you plan to wet shave with the Panasonic, the stubble sensor won’t matter. It’s designed for use dry. I have the 61. It uses the same head as the 65/95. I want to add to my previous comment that I have been a loyal Braun user for 20 years. In the last few years though, their foil heads have become junk. They dull quickly and require frequent replacement. Not like the Braun of prior years. I am hoping switching to Panasonic will make me a happy shaver again. As with anything in life, it all comes down to personal choice and electric shavers are no exception. I have used rotary razors since last 10 years (mostly Philips) and occasionally use safety razors when i feel to make my shaving a different experience. They work extremely well on my sensitive skin especially new Norelco range, which are technologically brilliant than their predecessors. Have to agree with previous comment on the declining quality of foil shavers though. I have noticed this as a trend across the foil range and brands than just specific to Braun. 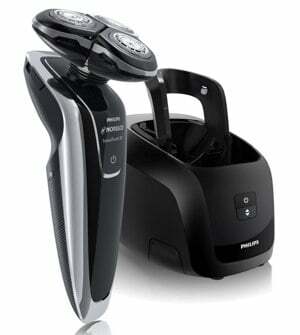 This generation of Panasonic shavers is definitely an upgrade in comfort and quality. Totally worth a try! Just bought this because wet-shaving your head with a cartridge razor several times a week is an expensive hassle, and the internet says this thing does a good job of shaving your head. We only tested on bottoms of heads, not tops, so curious to know how it works for you. hello i am french women i have website aubout electric shaver,thank you for this informative post. I’ve been a huge fan of the Norelco for several years now. It definitely offers a great shave and durable razor for the price. Can anyone compare the LV65 to the new Series 9 shavers. My Arc 4 has been dropped and no longer works , was going to get the LV65 then notired Braun have had these new shavers out for just under a year. We haven’t had a chance to test the Braun Series 9 yet. When we did our test with the Panasonic Arc 5 vs the Series 7, we preferred the Panasonic, but it was close. The Braun Series 9 is a step up from the Series 7 with a claimed faster shaving mechanism. User reviews on Amazon indicate people have been very happy with the Series 9 and some, who are familiar with both, suggest is a slight improvement over the Series 7: See Braun Series 9 shaver reviews and price on Amazon. Does that mean it is better than the Panasonic Arc 5? We can’t say until we’ve tested it, but we would predict the shaving results are very similar. And users have been very satisfied with the Arc 5, as well. If you were happy with your LV65, I don’t see a compelling reason to switch. But if you do, let us know what you think. I used to always buy Remington shavers, I used to swear by them, but then a while back they completely redesigned them to this cheap black shaver and they don’t work well at all. I’ve been looking for a new shaver for some time now, maybe I’ll try the Panasonic. I have to say this razor is the best electric razor I have owned so far got this at http://www.mensgroominglab.com/ for a good price. At first I was skeptical based on all electric razors are the same… I was wrong. After using this to replace my previous Braun Wet & Dry shaver with 3 foils… This dominates with a smoother shave and cleaner look & feel.. It takes about the same time to shave overall but the results a better. The Panasonic Arc5 ES-LV65-S is a solid pick, but I prefer the Braun Series 9 9095cc. The Panasonic Arc5 has a really clumpy head, and the 4 foils seem like overkill to me. The Philips SensoTouch looks good, but I’m not a big fan of rotary shavers, as I don’t like the buffering motion - much prefer the traditional up / down shaving motion that foil shavers offer. The Braun series 9 is voted best shave in the UK - maybe Panasonic is more popular in the US. Either way, both are as good as it gets for men’s electric shavers.